90 • March 2019 • S I G N & D I G I T A L G R A P H I C S ARCHITECTURAL AND ENVIRONMENTAL Product Highlights Welcome to the Product Highlights section, where each month we offer you resources to enrich and expand your business with great services and products from our adver- tisers. 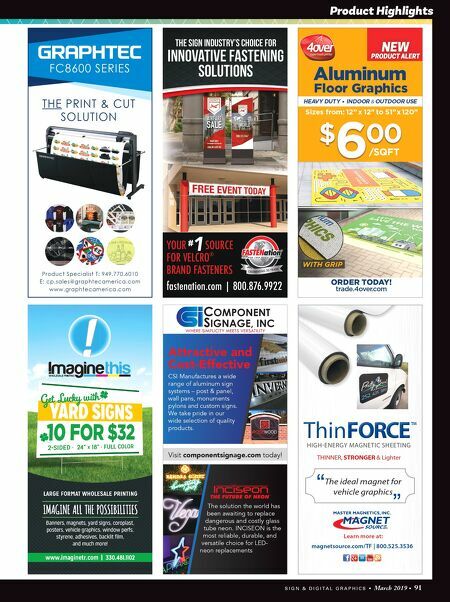 Quickly find and request free information on the suppliers featured in this section by visiting info.sdgmag.com. colors that you can create a variety of custom looks." 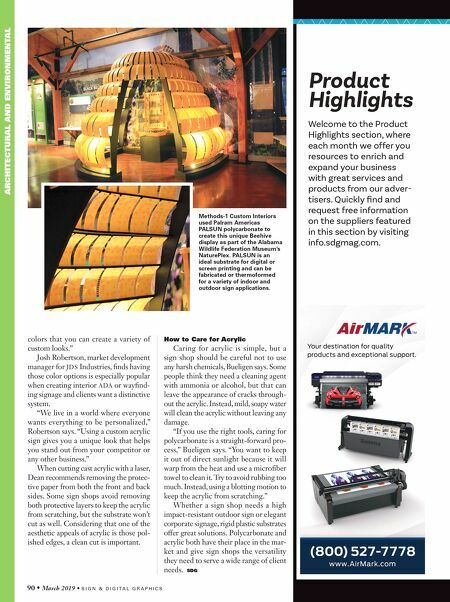 Josh Robertson, market development manager for JDS Industries, finds having those color options is especially popular when creating interior ADA or wayfind- ing signage and clients want a distinctive system. "We live in a world where everyone wants everything to be personalized," Robertson says. "Using a custom acrylic sign gives you a unique look that helps you stand out from your competitor or any other business." When cutting cast acrylic with a laser, Dean recommends removing the protec- tive paper from both the front and back sides. Some sign shops avoid removing both protective layers to keep the acrylic from scratching, but the substrate won't cut as well. Considering that one of the aesthetic appeals of acrylic is those pol- ished edges, a clean cut is important. How to Care for Acrylic Caring for acrylic is simple, but a sign shop should be careful not to use any harsh chemicals, Bueligen says. Some people think they need a cleaning agent with ammonia or alcohol, but that can leave the appearance of cracks through- out the acrylic. Instead, mild, soapy water will clean the acrylic without leaving any damage. "If you use the right tools, caring for polycarbonate is a straight-forward pro- cess," Bueligen says. "You want to keep it out of direct sunlight because it will warp from the heat and use a microfiber towel to clean it. Try to avoid rubbing too much. Instead, using a blotting motion to keep the acrylic from scratching." Whether a sign shop needs a high impact-resistant outdoor sign or elegant corporate signage, rigid plastic substrates offer great solutions. Polycarbonate and acrylic both have their place in the mar- ket and give sign shops the versatility they need to serve a wide range of client needs. SDG Methods-1 Custom Interiors used Palram Americas PALSUN polycarbonate to create this unique Beehive display as part of the Alabama Wildlife Federation Museum's NaturePlex. PALSUN is an ideal substrate for digital or screen printing and can be fabricated or thermoformed for a variety of indoor and outdoor sign applications. www.AirMark.com (800) 52 7-7 7 78 Your destination for quality products and exceptional support.